Biochar is a solid material obtained from the carbonisation of biomass – a thermochemical conversion in an oxygen-limited environment. Biochar may be added to soil in order to improve soil functions and to reduce emissions from biomass that would otherwise naturally degrade to greenhouse gases. There are many different ways to make biochar, but all of them involve heating biomass with little or no oxygen to drive off volatile gasses, leaving carbon behind. This simple process is called thermal decomposition usually from pyrolysis or gasification. These methods can produce clean energy in the form of gas or oil along with the biochar. This energy may be recoverable for another use, or it may simply be burned and released as heat. It’s one of the few technologies that is relatively inexpensive, widely applicable and quickly scalable. Diagrams courtesy of Nature Publishing Group. Biomass waste materials appropriate for biochar production include crop residues (both field residues and processing residues such as nut shells, fruit pits, bagasse, etc), as well as yard, food and forestry wastes, and animal manures. Large amounts of agricultural, municipal, and forestry biomass are currently burned or left to decompose and release CO2 and methane back into the atmosphere. They also can pollute local ground and surface waters—a large issue for livestock wastes. Using these materials to make biochar not only removes them from a pollution cycle, but biochar can be obtained as a by-product of producing energy from this biomass. Feedstocks must not contain unacceptable levels of toxins such as heavy metals which can be found in sewage sludge and industrial or landfill waste. Equipment for making biochar can be as simple as a primitive campfire or as complex as a modern bio-refinery. The basic process is called pyrolysis. Pyrolysis is the breaking down (lysis) of a material by heat (pyro). As the material is broken down, it releases gas. This is the first step in the combustion or gasification of biomass. All the processes involved in pyrolysis, gasification, and combustion can be seen in the flaming match. The flame provides heat for pyrolysis, and the resulting gases and vapors burn in the luminous zone in a process called flaming combustion, leaving behind char. After the flame passes a given point, the char may or may not continue to burn. When the match is put out, the remaining wood continues to bake, or pyrolyze, releasing a smoke composed of condensed tar droplets as it cools. Read the article Campfire Lessons: Breaking Down the Combustion Process to Understand Biochar Production by Mark R. Fuchs, M. Garcia-Perez, P. Small and G. Flora published in the Biochar Journal, 2014 for a good step by step explanation of how biochar is formed. The carbon in biochar resists degradation and can hold carbon in soils for hundreds to thousands of years. Biochar is produced through pyrolysis or gasification — processes that heat biomass in the absence (or under reduction) of oxygen. In addition to creating a soil enhancer, sustainable biochar practices can produce oil and gas byproducts that can be used as fuel, providing clean, renewable energy. 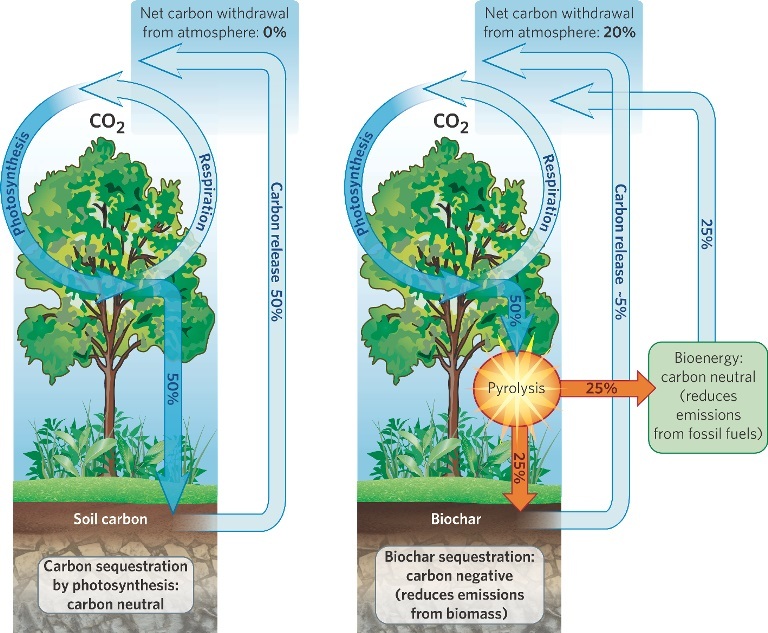 When the biochar is buried in the ground as a soil enhancer, the system can become “carbon negative.” Biochar and bioenergy co-production can help combat global climate change by displacing fossil fuel use and by sequestering carbon in stable soil carbon pools. It may also reduce emissions of nitrous oxide. Fossil fuels are carbon positive; they add more carbon dioxide (CO2) and other greenhouse gasses to the air and thus exacerbate global warming. Ordinary biomass fuels are carbon neutral; the carbon captured in the biomass by photosynthesis would have eventually returned to the atmosphere through natural processes like decomposition. Sustainable biochar systems can be carbon negative by transforming the carbon in biomass into stable carbon structures in biochar which can remain sequestered in soils for hundreds and even thousands of years. The result is a net reduction of CO2 in the atmosphere, as illustrated in the diagram. Carbon in biochar can persist in soils over long time scales. 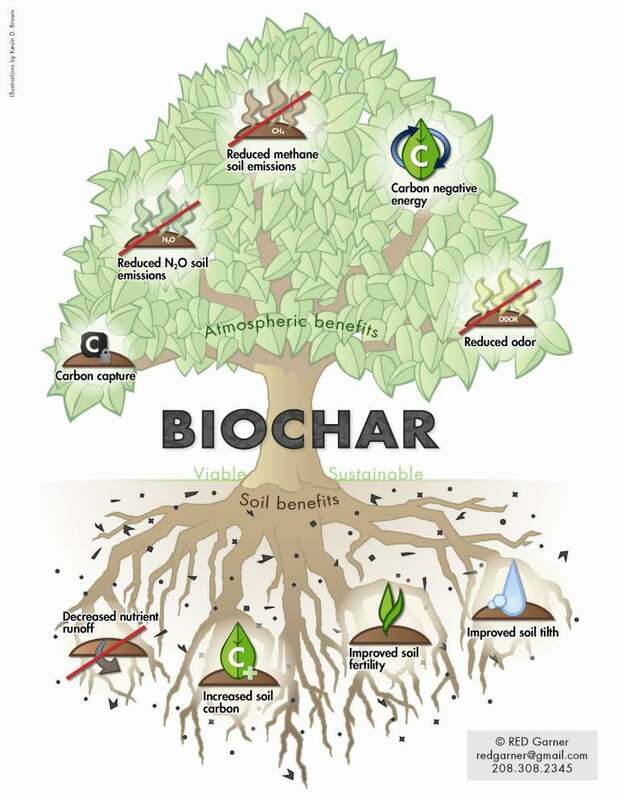 Beyond the carbon sequestered in the biochar itself, biochar incorporated in soils also offers numerous other potential climate benefits. Soil Fertility: Biochar can improve soil fertility, stimulating plant growth, which then consumes more CO2 in a positive feedback effect. Reduced fertilizer inputs: Biochar can reduce the need for chemical fertilizers, resulting in reduced emissions of greenhouse gases from fertilizer manufacture. Reduced N2O and CH4 emissions: Biochar can reduce emissions of nitrous oxide (N2O) and methane (CH4)—two potent greenhouse gases—from agricultural soils. Enhanced soil microbial life: Biochar can increase soil microbial life, resulting in more carbon storage in soil. Reduced emissions from feedstocks: Converting agricultural and forestry waste into biochar can avoid CO2 and CH4 emissions otherwise generated by the natural decomposition or burning of the waste.